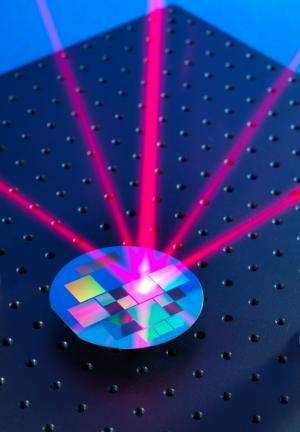 A microfabricated grating transforms a single incoming laser beam into a light field specially tailored for trapping and cooling atoms. Researchers from the National Physical Laboratory, University of Strathclyde, Imperial College London and University of Glasgow have developed a portable way to produce ultracold atoms for quantum technology and quantum information processing. Their research has been published in the journal Nature Nanotechnology, where it is featured on the front cover. Many of the most accurate measurement devices, including atomic clocks, work by observing how atoms transfer between individual quantum states. The longer the atomic transition can be observed, the more precisely it can be measured. Slow-moving ultracold atoms enable the longest observation times and the highest precision. By illuminating the atoms with laser light, the Doppler effect is used to cool them down to microkelvin temperatures, a task normally achieved in a large apparatus. Complementary approaches to microfabricate the prototype chips were developed by NPL and Imperial College London. Following this, the team further developed the technology which can make an important contribution to metrology and high-precision measurements by enabling atomic quantum sensors to be miniaturised. Advanced versions of the specialised optical diffraction gratings were co-designed by the groups in the collaboration and microfabricated by Kelvin Nanotechnology Ltd using Glasgow's James Watt Nanofabrication Centre. These researchers have developed a technology which enables a far more compact optical setup than previously, yet it can still cool and trap large numbers of atoms for use in portable instruments. They pattern the surface of a semiconductor chip to form a diffraction grating, splitting a laser into several beams that trap and cool the atoms. Portable clocks, magnetometers and accelerometers have wide-ranging applications, including navigation on earth and in space, telecomunications, geological exploration, and medical imaging. This atom chip follows on from NPL's recent demonstration of a novel ion microtrap chip, which appeared in Nature Nanotechnology in 2012. Read "Cold atoms: Trapped by nanostructures" in Nature Nanotechnology - News and Views - that accompanies the letter.